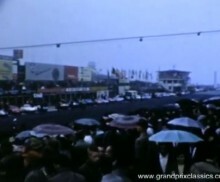 Sixties Racing Videos - Grand Prix Classics - La Jolla, Calif.
Every season, the Leonard family was going to different race tracks in Europe to watch the races. In 1960, a then five year old Mark Leonard was with his father Max at the Nurburgring for the 1000km race. Max Leonard, his 8mm video camera in hand was filming the race from different locations on the track. 1961, a six year old Mark Leonard was with his family at the Spa Francorchamps, Belgium track for the Belgian Grand Prix that saw the four Ferrari works drivers at the first four places. Now over fifty years later, Mark is still involved more then ever in automobile racing. Either driving in vintage racing events around the world, or taking his son Max to the race track any chance he has.